You should do a blog post about how to buy things effectively on Steam. Nearly everything in the store that wasn’t released in the last month goes on sale for anywhere between 25-75% off. 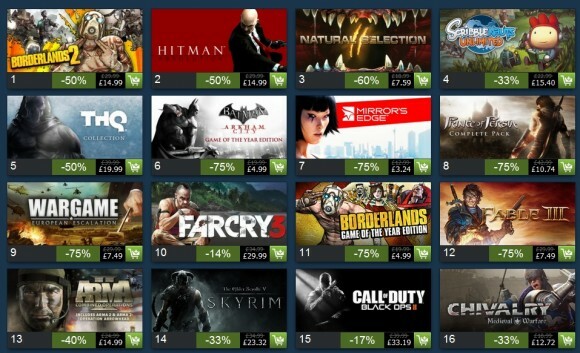 There will be a set of daily deals where games are particularly heavily discounted for 48 hours. A relatively new thing are the flash sales, which are the same as daily deals except they’re available for a much shorter period of time. Finally there’s a sidebar where the community can vote on one of three games to go on sale for the next 12 hours or whatever. The set structure and rules of the sale are useful because while it’s designed to look ephemeral and unpredictable with all those timers slowly ticking down to zero, if you know how it works you can guarantee yourself the best bargain possible following just two simple rules. The regular discounts are merely there to make the dailies look even better, but they can still lure in people who are unfamiliar with how Steam works. The fact of the matter is that unless you somehow lack the patience to wait until the end of the sale to see if whatever it is you’re after turns up as a daily, there is absolutely no reason to buy anything that isn’t prominently featured on the front page of the store as either a daily or a flash sale. If you do, the chances are that it will end up with a larger discount later on and you’ll feel stupid for not waiting. This has led to the following piece of received wisdom, which differs from most received wisdom in that it’s actually correct: Never buy anything during a Steam sale unless it’s a daily or it’s the last day of the sale. Right, so now you’re checking Steam every day to see if the game you want has gone on sale yet, which is exactly what Valve want you to be doing. The dailies and flash sales are the same thing with different timers attached, and in fact there’s an awful lot of bleedover between the two: things which are dailies will often turn up later as flash sales and vice versa, for the same discount. Dailies and flash sales carry the maximum possible discount for that particular Steam sale, so if you see what you want come up as a daily or a flash sale you’re safe buying it. The only way you’re going to get it any cheaper is by waiting six months for the next Steam sale. The stuff in the sidebar also carries the maximum possible discount, but since it’s slaved to the whim of the Steam user base nothing good ever makes it through the voting process. Seriously, during the Summer sale Bioshock won the vote one day; I forget what else was up for consideration but I can guarantee you it was better than a five year-old FPS. Now, if you stick to the above guidelines you will never end up paying more than you have to for a Steam game during that particular sale. If you take a slightly longer-term view then things become a little more complex since the price of games will fluctuate depending on how well a particular game is doing in the marketplace/how that game’s publisher wants to play it, but in general you can use the level of discount to gauge how much cheaper the game is likely to be in the future. There are also games that aren’t high-profile enough to feature as dailies, so if you’re stuck on the last day of the sale wondering whether or not something is worth buying this is how you do it. 25-40% off – Usually reserved for new games released within the last three months. I personally wouldn’t go near anything in this bracket, since I either bought it on release for close to full price, or else I know it’s going to be 50% off or more at some point in the next six months. You only pay this price if it’s something you want now now now. 50-66% off – A good bargain, but with some wiggle room for a larger discount in the near future. Certainly you run the risk of having it crop up again in a month or two as a weekend deal/midweek madness for 75% off. Still, even if this did happen you’d be losing a few pounds at most, so it’s a question of whether or not you want to wait and see for the sake of a small amount of cash. 75% off or more – The absolute cheapest it will ever be on Steam. The only way for this game to get cheaper is if the developer/publisher reduces the base RRP — which does happen, but which is rather outside Steam’s purview. Discounts of more than 75% on things that are actually good are very rare, so you should treat 75% off as the best possible scenario and not worry about whether or not it might come up at 80% later on. And that’s it, really. The only way to do better than this is to pay attention to really long term trends in overall game pricing (i.e. over the last half-decade or so) , which I doubt anyone who isn’t me really has the time or inclination to be bothered with. Hopefully this will save somebody some money, or at least ensure they spend that money on two games instead of one. Except for Civ IV Complete, which is on sale for the next five hours or so. But yeah, in general the things you’re asked to vote on are a bit odd, and so are the things that eventually get to the top of the pile. I’d add another bit of advice, which is not to buy anything that wouldn’t at least pique your interest without the discount. 2 euro worth of junk is still junk. Yeah that’s a good tip. I’d actually go further and say not to buy anything that you don’t see yourself playing in at least the next month or so. I’ve picked up too many games “for later” only to have them remain untouched for years. I think the other two things were a Might and Magic spin-off and a shooter, but I can’t remember anything about the (possible) shooter. I agree with you, but I think it’s a personal thing how far you want to go with your delayed gratification / self-control / not hoarding. Interestingly today in the vote it’s Civ V vs. Crusader Kings 2 vs. Shogun 2. So no duff choices there. Excellent. P.S. and off-topic – I did make an effort to get into Darklands since you last posted about it, but I couldn’t get past my first fight with n’er-do-wells in town. I will tackle it again, though. I think this time I’ll beef up my not-exactly-fighter characters a bit more. Here is a tip: javelins. Lots and lots of javelins. Or at least two or three per person. Makes the starting fights trivial if you can severely wound two or three of the bad guys before they ever reach you. Also, please grab AI War: Fleet Command if possible! Okay, I take that back: Serious Sam 3 was normally 75% off this sale…it won the vote and got to 85% off! Ah yes, AI War, where completing the tutorial took me six hours and left me utterly drained. Good game, but it’s not something I’ve found myself in the mood for since. I bought myself the Orcs Must Die bundle (included 1 and 2) for less than $8 USD. I’m still enjoying passing part 1. They’re both great games, skull refund button notwithstanding, but lack of endless mode in 1 means I would have skipped it for 2 if I were in your position.